There are no two brands in the entire watch community that have more of a sibling-type relationship than Tudor and Rolex. The former is the little brother, and the latter is the eldest. This dynamic begs a few crucial questions between Tudor vs. Rolex. Why are they often mentioned in the same breath? Below, I detail the differences between these two esteemed brands so that you can choose between them with confidence. The reason why these two brands are forever linked is a man that went by the name of Hans Wilsdorf. The story begins when this entrepreneur founded Rolex in the early 1900s. Unlike many companies, who have growing pains in their first few years, this brand became a well-respected name instantly. The reason was exceptional craftsmanship, as they produced a variety of inventions and breakthroughs throughout the next few decades. Eventually, Wilsdorf decided to expand and create a new brand. He named it Tudor as an homage to his favorite period in English history. What he set out to do with this company was make a more affordable and attainable product for those that could not or would not purchase a Rolex. While Tudor has not reached the same heights as its older brother, it is still a highly respected name in the watch industry. Our first area of analysis is style when it comes to Tudor vs. Rolex. The truth is that these brands have a very similar look and vibe. In my estimation, two key features separate them. First, Tudor pieces have a slightly different shape to their hands, which might look better or worse depending on your taste. Second, Tudor watches tend to come in brighter colors, while Rolex generally sticks to classic designs and coloring. Ultimately, the aesthetics of both brands are nearly the same. Unlike aesthetics, which are quite similar, the materials that each brand uses vary widely. One theme that we touched on above is that Tudor pieces tend to be a bit more unconventional. Such is true in the case of materials, too. While Rolex sticks to their signature in-house stainless steel and gold plating, Tudor likes to experiment with titanium cases, cloth straps, and more. Now, we move onto the more significant differences between Tudor vs. Rolex. The first is movement. One of the things that makes Rolex watches so special is that they produce almost everything in-house. This means that the movement inside your case is designed, manufactured, and assembled in the historic Rolex headquarters. The result is a piece that is truly unique. If you own one, no other watch will have the same movement as yours because nobody is breaking into the Rolex factory to steal their designs. 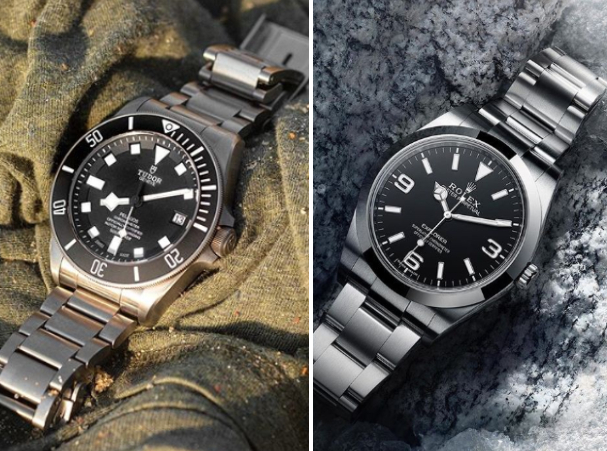 On the other hand, Tudor has historically assembled their watches with generic movements. While this choice does not mean that their pieces are unreliable, it does take away from the brand mystique. One thing to note, though, is that this trend has started to flip. Tudor has made a big comeback this decade, and as a result, are upping their game. One aspect of doing so is beginning to make some of their movements in-house, just like big brother Rolex. The most prominent example is the esteemed Tudor Black Bay, which many consider to be their signature piece. The second substantial difference between these two companies is the price points they sell at. As far as I can tell, the cheapest Rolex on the market is the Air King, which is one of their less popular pieces. Even so, you’re likely going to have to pay at least $6,000 for it. Many of the more sought-after models are in the $10,000 to $20,000 range, with some even reaching up to $40,000. Unless you have a lot of cash to throw around, these pieces will be out of reach. Tudor, on the other hand, is a much more accessible brand. What you sacrifice in exclusivity and mystique, you gain in a significantly lower price range. While still a bit steep, the $2,000 to $3,500 range that Tudor specializes in is much more realistic than their equivalents over at Rolex. Now that you have all of the relevant information about Tudor or Rolex, it is time to make your decision. You have three options. First, you can go with the tried and true luxury timepiece powerhouse that is Rolex. Of course, doing so will have a hefty price tag. Second, you might want to enjoy the Swiss heritage and craftsmanship these two brands share, but save yourself a substantial amount of money by opting for a Tudor. Your last option is my favorite of all: Don’t choose at all. If you have the money, getting yourself both a Rolex and a Tudor is a dream come true for any timepiece collector. Astronomical Watches: What Are They Exactly?